As a loving cat owner, you want to make sure you’re giving your pet the most nourishing meals possible. Unfortunately, not all cat foods are equal in nutritious value – in fact, some are downright dangerous. Your cat food choices make a big difference for your kitty’s health. If you want to keep your feline friend happy, energetic, and strong, you need to know which cat foods to avoid and which to seek out. Just like lions, tigers, and their other cousins, domestic cats love and need meat. Therefore, above all, you should look for cat foods with plenty of meat. Less desirable types of cat food contain more grain and less meat. There are three types of grain you need to avoid: soy, wheat, and corn. That’s because your cat might be allergic to one or more of those ingredients. To avoid grain altogether, you’ll want to rely on wet cat food. Wet cat food contains more protein and, more often than not, actual meat products. 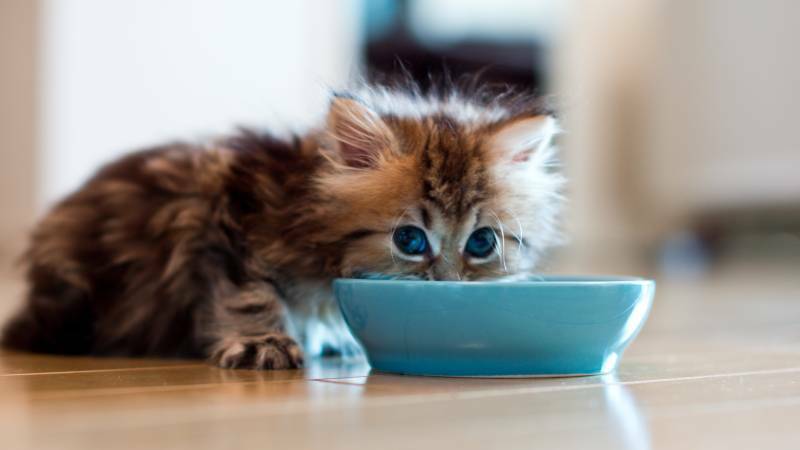 Your cat might be fine consuming dry food; however, if there’s a chance your furry housemate isn’t taking in enough water, dry food can lead to medical issues like urinary blockages. Wet food will help him or her stay properly hydrated. High-quality cat food brands list specific ingredients on their labels — lamb and turkey, for instance. Less reliable cat food makers, meanwhile, are often unclear. They may say that their food contains meat, for instance, but they won’t say what kind. This is why cat owners should seek specificity in their pet’s food. Make sure you know exactly what ingredients are included in what you’re feeding your cat. There are certain telltale signs that a cat food is less than nutritious or possibly even harmful. As mentioned above, try to avoid grain-heavy foods. You’ll also want to avoid harsh chemical preservatives such as BHA, BHT, and Ethoxyquin. 1. Plant Protein: Cats need protein. The amino acids in protein are a prime energy source, and their bodies use up those amino acids rapidly. Even so, felines should get their protein from meat and not plants. Plant proteins can give them digestive problems and cause them to put on excess weight. 2. Carbohydrates: Left to their own devices, cats would steer clear of carbohydrates. They lack the enzyme pathways to properly handle those organic compounds, and they have no practical use for them. Therefore, low levels of carbohydrates — about 1 to 2 percent per serving, according to CatInfo.org¹ — are ideal for your four-legged companion. Bad cat food can be up to 50 percent carbohydrates. 3. Unidentified By-Products: As the name suggests, unidentified by-products are added products that often make their way into cat food. They can include animal meat, but the reality is you can’t be entirely sure what these by-products are. As The Spruce Pets² writes, you want to make sure any by-products included in your cat’s food are far down on the ingredient list — and you should avoid any cat foods that have by-products as the first ingredient listed. 4. Carrageenan: Carrageenan is a thickening substance derived from edible seaweed. Why do you want it out of your cat food? Well, it can lead to a series of gastrointestinal problems, including ulcers and tumors. It might also cause your cat’s immune system to react, and his or her digestive organs could become inflamed. 5. Artificial Colors: Many cat food companies dye their products so they’ll seem more appealing to pet owners. Unfortunately, some of those dyes are carcinogens, PawDiet3 reports, and none of them offer any health benefits. The key to finding affordable and nutritious cat foods is to do some research. To start with, talk to your veterinarian to find out what brands she or he would recommend. During this discussion, tell your vet what your price range is. As with every research project these days, online searches and internet resources are our friends. Search online to learn about different cat food brands, their ingredients, the way they process their cat food, and what consumers have to say. That way, you can learn which cat food makers have the best reputations and which have been linked to food poisonings and other problems. Once you have the names of a few trustworthy manufacturers in mind, online commercial platforms can help you find discounted products and outstanding deals. You can comparison shop, looking for the lowest price – as well as online discounts and coupons – that allow you to save on the healthiest food available for your cat. If you’re interested in finding the right healthy food for your cat, start a search today.